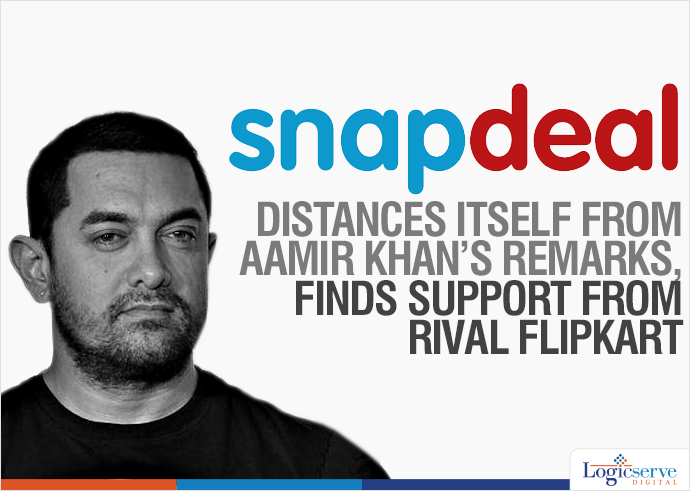 Snapdeal distances itself from Aamir Khan's remark, finds support from Flipkart's Sachin Bansal. While people took to Twitter with ‘#AppWapsi’ asking others not to buy from Snapdeal, the company attempts to make a comeback with ‘#SnapdealForIndia’. E-commerce major Snapdeal, which has suffered tremendous damage after the remarks by its brand ambassador Aamir Khan, now tries to distance itself from the entire controversy and claims that the remarks were made by him (Aamir) on his personal capacity. Kunal Bahl, the founder of Snapdeal had to issue a statement after people took to protesting against Aamir Khan’s comments on ‘increasing intolerance in the country’ at the RNG Awards in New Delhi. The company had to pay heavily for the remarks made by the Bollywood star. Snapdeal’s rival Flipkart was the only among the entrepreneurial community of India to openly extend support to the e-tailer by saying that brands don’t buy into brand ambassador’s personal opinions. While it is still not clear how many Snapdeal apps were uninstalled, Apple’s app store as well as Google Play are flooded with user comments down-rating (one star rating out of five) the application.